Inspiration for a painting often strikes when walking around your garden. Inspiration often ends when the mass of leaves and flowers you’ve picked are now strewn across your kitchen table, trying to pass themselves off as a still-life! When you put paint to canvas, the whole thing looks unrealistic and a little dated. Is it the leaves? Is it the vase? Is the composition wrong? Why don’t the petals appear translucent? Trying to transfer that feeling of simplicity and light into a studio still life can become very frustrating. Greens that appeared bright outside, suddenly become more muted inside and if you try to paint them as brightly as you observed in the garden, they can appear fake. Flower heads that appeared really white and flat outside, now need added contrast to make them seem three-dimensional on the canvas. 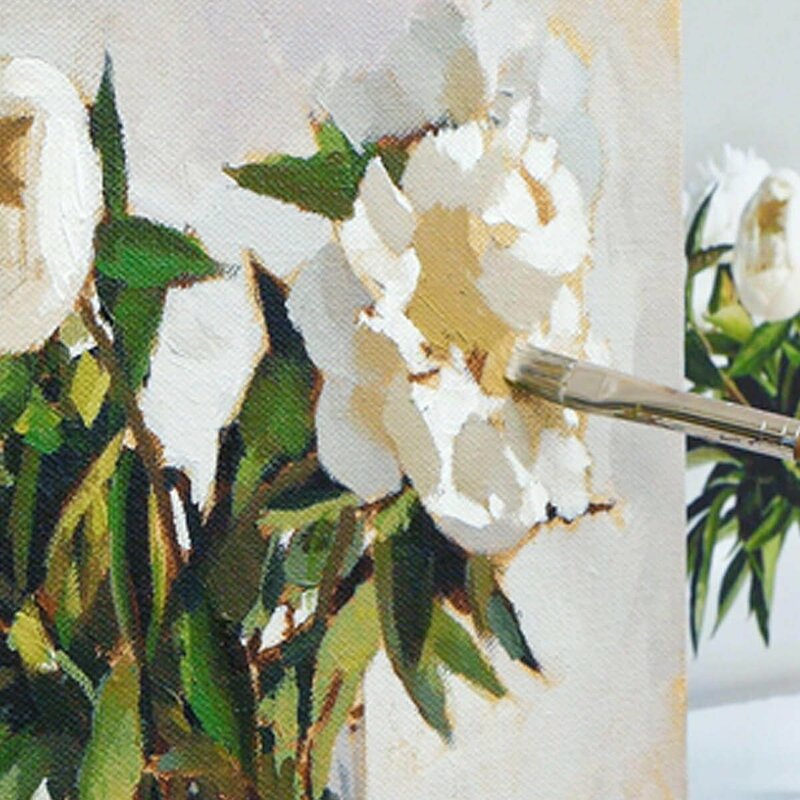 This course will guide you through the process of creating an Impressionistic floral still life painting in acrylics, recreating the colour palettes of nature from start to finish. Over 3 hours of tuition, you’ll learn how to simplify and separate tonal values into areas of light and shadow, how to use warm and cool colours effectively and how to mix and balance naturalistic greens creating a subtle acrylic palette and a realistic sense of sunlight hitting the leaves & petals. I’ve developed this painting course to show you how the arrangement of colours, composition and tonal value range result in a more contemporary painting that will still allow you to see good form. We’ll be taking classical painting techniques to build up an in-direct floral painting in acrylics. Once you’ve discovered the importance of accurate drawing, layout and establishing good tonal values – you’ll move on to using colour strings. This method will develop your knowledge of pigments and allow you to create the perfect balance between warm and cool. It then means when you’re standing at the easel you can feel confident with your colours throughout every stage of the painting. 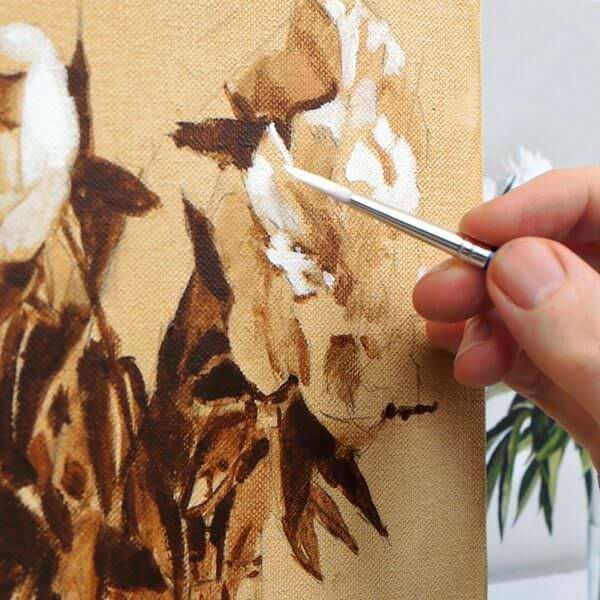 Working through these simple step-by-step tutorials, you’ll learn how to tune your eyes between subtle shifts of greys, creams and whites, mix a subtle modern colour palette, whilst still learning classical painting techniques. In just a few hours you can create your own floral masterpiece! 1 x Floral Still Life subject from start to finish, based in the studio working from a reference image. 8-downloadable video lessons, split into separate chapters that follow on sequentially. Each stage is a detailed yet easy-to-follow process. Downloadable jpeg reference images, and reference line drawings. Printable Class materials list, 3 1/2 hrs of detailed video instruction. 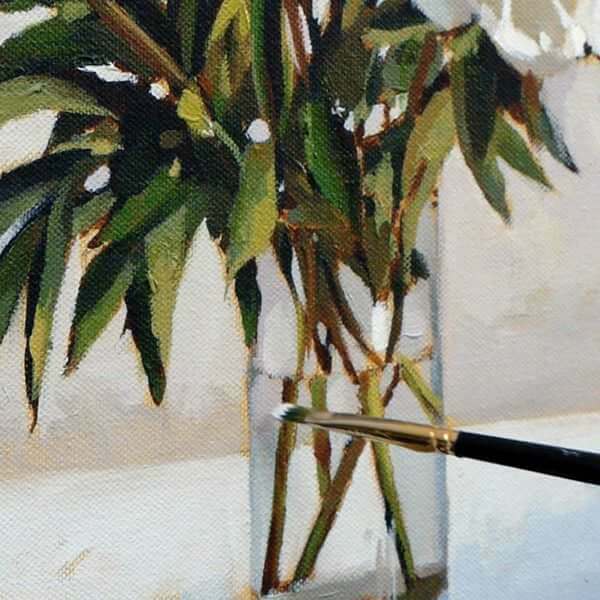 Learn how form is the key to creating realistic florals and how a tonal study of a Lily, illustrates the ‘background effect’. A visual introduction to all the materials, paints, mediums, palettes and canvas and how to use and apply an archival ground to your painting. Clean lines, drawing realistic ellipses and learning to ‘see’ the tones. Developing brush techniques, blocking-in the pattern of darks and pushing your tonal range. Controlling tonal steps using a ‘value strip’, mixing perfect greys, using only two colours, and using my favourite acrylic medium to softly blend edges. Introducing how to use a colour wheel, and a simple palette, to mix the perfect greens whislt using a stay-wet palette to create your own ‘colour strings’. Tuning our eyes to observe the subtle shifts within the petals, painting the flower heads using 3 base mixes and balancing warm ochres and cool greys. Using a palette knife to add flair and texture and then finishing with subtle glazing for that final glow to your painting. I’ve taken care to film everything from my perspective so you can see exactly what I’m doing as we go through the entire painting process in real-time. With over 3 hours of video instruction, full-color photographs and drawing guides. This course has been developed with a beginner in mind, carefully going through the steps at a pace that introduces new colours and techniques slowly. 8 Downloadable Step-by-Step Video Lessons. Over 3 hours of detailed video instruction that once downloaded – you have any time, anywhere access. JPEG reference images used throughout the course, including the photo reference I demo with, a copy of my pencil sketch for the line drawing. 10 separate JPEG images to guide you through each stage. NEW – Video timecode index to instantly jump back to any section of the lessons you’d like to revisit. The video files are large (3GB) so you need a broadband internet connection and enough space on your computer hard drive. A broadband internet connection – the files sizes for the video lessons are quite large (3GB in total) so can take a while to initially download (depending on your internet speed.) Once downloaded, they are yours to keep forever, watch without buffering or take to the garden and watch away from an internet connection! Enough free space on your Computer or iPad – You can download the files to a separate USB stick if you need extra storage. Photo Printer Paper – I use Epson Archival Matte or Epson Photo Glossy. 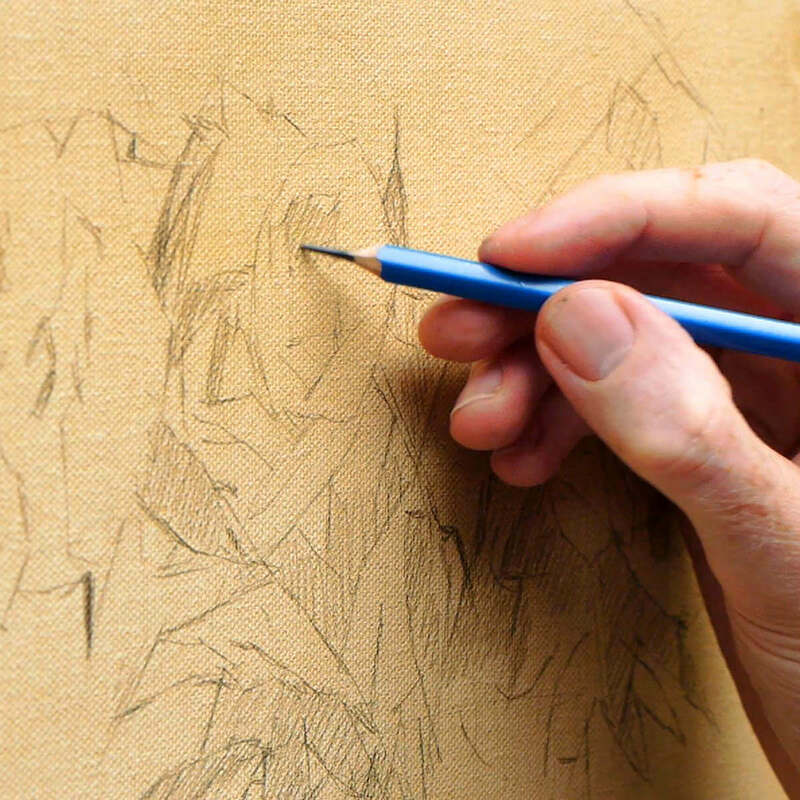 30 mins – 2 hr per session – You’ll need to be able to dedicate between 30 minutes to 2 hrs for each section, for example, the blocking-in might take 10 minutes, but the painting of the leaves may take a couple of hours. I have followed your free online tutorials for a couple of years and have had some success. My husband decided to buy me this floral course and I have just finished the painting and I have to say it was such a lovely experience to go through the whole process with instruction along the way. I am very pleased with the results and I’m inspired to take on new challenges. I would say that this course helps to free up one’s style to paint more loosely which I have struggled to get away from and often my style can look a bit cartoon like. I’m currently trying my hand at oils and some portraiture and hope to be able to start another course soon. Hi Will, Thank you for a very helpful video course. I learned so much, from how to do a tonal underpainting, to how to mix accurate colour strings, to how to add impasto touches to a painting. These are all lessons that I can apply to future paintings, and I’m looking forward to trying them out with my own still life compositions. This course is very clearly explained step-by-step, so it’s suitable for beginners. But I also think that it’s suitable for more experienced painters, as so many skills are covered in the course. I recommend this course for anyone wanting to create realistic and yet painterly pictures. Hi Will, I just completed the Floral Still Life painting from your online course. I enjoyed it immensely. I had not worked with only 5 colors before and now I feel confident about mixing greens and a lot of other colors. Is there a time limit for the course? How many times can I watch it? The course is a series of downloadable video lessons. Once they are downloaded they are yours to keep forever. There is no time-limit, you can watch them as many times as you like. If you change computer in the future just drop me an email and I’ll send you through some fresh links. From a flat colour ‘coloured ground’ (think painting a wall) to a simple pencil line drawing, to the first painting stage using one colour straight from the tube. This course is all about progress. Sure, your colours might be a little different, the drawing may go a little out, and the underpainting may be a bit too thin. But these are all very small changes, the principles are still being developed and learnt, so even if you’re going ‘wrong’ you’ll still be developing as a painter.